Earlier this week, The World SF Blog paid tribute to Haikasoru, an imprint of VIZ Media focusing on English-language translations of Japanese science fiction and fantasy. Haikasoru’s editorial director, Nick Mamatas, contributed a post on some distinctive features of Japanese SF, both cultural and literary—especially the fact that, although “Japanese SF authors grew up reading US and UK SF and have fully embraced the idiom,” in these books “the future is Japanese,” and it can be very edifying for Western readers to be exposed to more non-Anglo, non-American visions of the future. His post reminded me that I’d actually gotten in touch with the folks at Haikasoru a while back, with the idea of soliciting some guest essays from their translators for the recurring series here at Beatrice, and that Mamatas had kindly put together a bit of Q&A where he approached Jim Hubbert and Cathy Hirano and asked them about their work on novels like Jyouji Hayashi’s The Ouroboros Wave and Noriko Ogiwara’s Dragon Sword and Wind Child. I’ve been meaning to post this for a while, and I’m glad I finally pulled myself together and got it online, because there’s some really wonderful insights into translation in their answers to Mamatas’ questions. “The Japanese science fiction and fantasy we publish is meant to compete against the best English-language books on the shelves,” he wrote in his introduction to this piece. “For that I needed translators who had the instincts of novelists, and those are few and far between.” Based on these answers, and what I’ve read of the books, he’s found at least two winners. What’s it like, being North Americans in Japan and working as translators? Jim Hubbert: This is a bit hard to answer. Since I’ve spent most of my adult life in Tokyo, I’m not sure what it would be like to be a translator in North America! Japanese has been a central interest of mine since the mid-70s, and I can’t imagine being away from the environment where it’s spoken. I suppose I could be based somewhere else and translate, but without having the language coming at me every day, I’d worry that my instincts for meaning and nuance would suffer a bit. Japanese is a radically different vehicle of expression from my native English, and it still gets the drop on me regularly, which is part of the fascination. Since I’m based in Japan, keeping my own idiolect current and evolving is something I try to work at. Through entertainment and the Internet I have no shortage of access to the English language—better access than I’d have to Japanese, were I outside of Japan—but I try to keep myself exposed to different voices. I don’t have a huge fiction library, but if I like something, I’ll go back to it every few years. Some nonfiction is amazing from a language standpoint, like Shelby Foote’s Civil War trilogy, which was my mental tuning fork for rendering some of the violence in The Lord of the Sands of Time. I think of the time I spend reading fiction as another form of language study. Authors have their own distinct idiolects. Without diverse exposure to what can be done with English, I’d have a harder time finding the right tone when translating fiction. Cathy Hirano: Well, like Jim, I don’t really have anything to compare it with. I’ve lived in Japan since I was twenty—this is where I learned my Japanese and Japanese is the language that surrounds me, the one I hear and speak most of the time. That has great advantages as a translator. It means the language is alive—I can feel it in my gut, absorb it from social context and respond to it instinctively and emotionally rather than just intellectually. It also means I have easy access to the tangible and intangible elements of the culture, such as food, architecture, clothing, rituals and customs and to “experts” who can explain the things that I don’t understand, which even after thirty-two years are many. As Jim pointed out, however, the drawback is, of course, that being in Japan I have much less exposure to the English language and English speaking cultures. I need to make a conscious and continuous effort to keep my language and knowledge current, to keep up with the times, with the way words are used and understood, with how they “feel” to the reader. I do this by reading as much as possible, especially in the same field as the work I am translating, and by watching movies, documentaries, etc. I also have a network of family and friends who act as English language experts, readers and checkers. When I first began translating almost thirty years ago, it was much harder to get access to any of the above. Ordinary people like me did not have Internet or email. There was no Amazon.com and, come to think of it, I didn’t even have a video deck. English materials were very expensive in Japan and I could not afford to visit Canada very frequently. Nor were there many native English speakers nearby. I survived by reading and hoarding English language materials of all kinds, lugging back used books with me from Canada on my infrequent visits and getting people to send me books they no longer needed. The Internet and email revolutionized the way I work and cut down on the number of reference books on my shelves. It also allows me to enjoy the benefits of living in a rural city in Japan while maintaining the connection to the English language so essential to my work. 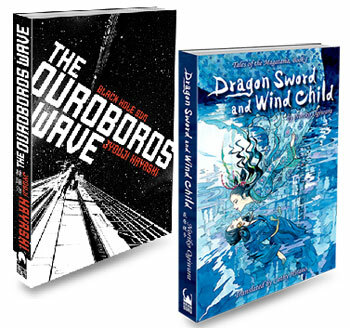 What specific challenges were there in translating novels, especially SF and historical fantasy novels like The Ouroboros Wave and Dragon Sword and Wind Child? Cathy Hirano: When I translate literature, it’s because I personally love the book and want others to share in that enriching experience. If no one reads it, there’s not much point in translating it. Concerning specific challenges in translating historical fantasy, they are similar to those for translating Japanese-based fiction. In pure fantasy, the authors generally supply much more detail about the culture, the context and the setting because they know the reader is experiencing that world for the first time. With fiction and historical fantasy, however, the author writes from the assumption that the reader is very familiar with the setting and the culture that goes with it. Noriko Ogiwara’s Dragon Sword and Wind Child is loosely based on the ancient Japanese creation myths while Mirror Sword and Shadow Prince is inspired by the tale of Yamato Takeru, a legendary Japanese hero of the fourth century. These myths are an integral part of the Japanese psyche—and not at all part of the English reader’s psyche. For me, the foreign reader, this adds to the books’ charm, but for me, the translator, this means learning as much as possible about the historical context, identifying implied and unstated information that is essential for the non-Japanese reader and presenting it in a way that does not bog down the text and detract from the English reading experience. To give just one example, the word miya, which is used in both books, means “palace” according to the Japanese-English dictionary. That seems simple enough—but what image does the word palace conjure up in an English reader’s mind? It is much more likely to be the huge ornate stone palaces seen in Europe or Walt Disney’s version of Aladdin’s palace than the Japanese image of multiple single storied wooden buildings surrounded by walled gardens. As the translator, I have to consider how important this concept is to the story. Is it something English readers can just gloss over and still get maximum enjoyment out of the story or do I need to use a different word or even the Japanese word, or perhaps add description in suitable places? Another frequent dilemma in the Magatama tales arises from the styles of speech that exist in Japanese. These different styles denote the speaker’s gender, position in society, place of origin, and relationship to the other party (parent/child, commoner/nobility, peer/peer, etc.). The Magatama tales include speech styles from peasants right up to the gods—each style so distinct that there is often no need in Japanese to mention who is speaking. This degree of distinction just doesn’t exist in English so once again I have to consider other means of conveying the same information. Jim Hubbert: In terms of what’s challenging: I’m going to stick my neck out and assert that fiction translation is a specialized form of substantive editing, since ultimately the translator’s goal is to produce the best text the author never wrote. The fiction translator is basically in an impossible position as far as creating a “faithful” rendering is concerned. A contract, or a patent or business document, exists to specify something. The more specificity the text embodies, the easier it is to transfer meaning from language to language. Give five different translators the same novel, however, and each one will have a distinctive take on it, because fiction works to trigger subjective images, not primarily to convey information. So which translation is “best”? Which is most “accurate”? The one that’s the most fun to read is probably not going to be the version that’s closest to the letter of the original. The most “faithful” translations are often produced by academics, who are mindful that the translated text should be usable as a resource for scholars. For my taste, a very close translation is like those freeze-dried meals you take on camping trips. Flash-frozen at the peak of freshness, no doubt about that. But the juices of the original are all too often missing. When I translate, I have to bring the substantive meaning of the text into English, but I also have to look at whether or not the text I’m producing is going to reflect the author’s intent in the best possible light. It’s like shooting someone’s portrait. Sometimes you have to be careful and pick your way, such as when the author’s goal is to elicit a certain reaction from the Japanese reader, and you know that close translation is just not going to produce a similar reaction in (most) non-Japanese readers. And of course, not every passage I translate strikes me as equally interesting or moving. Still, I have to strive to give the reader the full benefit of the author’s talent, and in a language that has very different rhythms and timbres from the original. I said this was impossible! The books I’ve had the opportunity to handle for Haikasoru have each been very different, though two of them were by the same author. The Ouroboros Wave is a collection of thematically linked short stories, and nearly every one is written with a different tone and voice. Keeping the voice consistent within a single story frame was tricky, not only in terms of my obligations to the text but also in terms of sticking to what I could handle authentically—faking or overreaching to create a distinctive voice is going to get irritating for the reader pretty quickly. The Lord of the Sands of Time posed a similar problem, since one of the protagonists is from a Bronze Age culture and the other comes from an advanced technical civilization. I tend to use a sort of Jekyll/Hyde approach to fiction. I’m a translator one day, an editor the next. I find it very hard to do both on the same day. When I’m translating and things are progressing well, I may start feeling as if I’m channeling the author, and I get a bit carried away with myself. The next day I can’t remember producing the text, but to my editor’s eye it may need a lot of help.